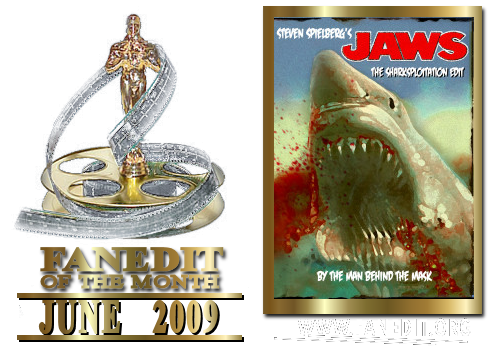 To give JAWS a kind of grindhouse feel and make the movie fun to watch for those who are not afraid to see this masterpiece being turned into something else (but it’s still JAWS, I did not turn the plot upside down). But most of all I did it for my own enjoyment. I hope it’ll work for you. New musics: Nana Mouskouri (Deep And Silent Sea), The Beach Boys (Surfer Girl), Metallica (The Unforgiven III), Townes Van Zandt (Dollar Bill Blues), Iggy Pop (Go For The Throat), Lalo Schifrin (JAWS), Bill Frisell (Spanish Ladies), Manowar (Warriors of the World). Thanks to Tranzor and Mollo for helping me during the making; and to Jorge for reviewing the workprint. Fun menus + a bonus video of a scene with an aternate music. - I will not list all the cuts because there are to many of them, some big and some very short. - Grainy picture, scratches and noises. Warm and cold tint added. - Most of the deleted scenes and alternate takes are back in the movie, not all of them though; And some are a bit poor quality. - Few, but noticeable, special effects to add more blood into some shots. 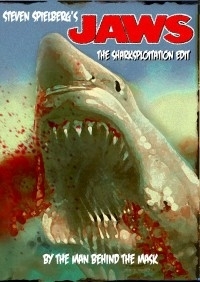 Jaws - The Sharksploitation Edit from TMBTM on Vimeo. Audio/Visual Quality: Always an odd one to rate for a grind house edit - picture was actually pretty good, considering the concept. I know that the picture and audio deteriorates during deleted scenes, but I believe this worked in favour of the edit and enhanced the experience. In fact, the only reason I give this a 9 instead of a 10 is due to the fact that at times I felt that the video quality was almost TOO good. IMO it wouldn't have been a bad idea to degrade the footage even more to match the quality of the deleted scenes. Visual editing: Excellent. Jarring visual cuts are there on purpose and benefit the experience. Titles, SFX etc. are all wonderfully done. Audio editing: Once again - the jarring edits work. The little jumps/repeats on certain lines are a nice touch as well as the odd added piece of dialogue. Narrative: Well, it works, and I'm not complaining. There are redundant scenes, but then again - maybe that's part of the point? Pacing could have been better, and I wouldn't have minded some more extreme changes to some scenes, but all in all this is a beautifully degraded alternate version of the film. Enjoyment: I enjoyed this. I'm not a big fan of the original, but I do like it, and this was a fun alternate experience. I loved what was done with Quints tale, and the ending - I was expecting a grand explosion (which wouldn't have gone amiss), but what followed instead was nothing short of brilliant. DVD was nicely put together as well. Lovely stuff. So I finally got around to watching this edit. This was a fun edit to watch. I liked most of the music selections. The amount of film "noise" and scratches etc. were not overly distracting and after awhile I didn't really notice it. I liked the zoom in of Quint at the town hall meeting. The stutter =/repeat frames and audio, was a nice touch, and it was used sparingly and spaced out enough that I felt it wasn't overused. The USS Indianapolis footage was a cool sequence. 1) The inclusion of the deleted scene of Quint at the music store buying the piano wire. I really don't know why they cut that scene from the movie. 2) The ending, I laughed. I liked the DVD Menu designs and the drive-in theater transitions at the beginning and end. As others have mentioned the narrative is a bit slow and the movie could have been shorter, but maybe that's just my short attention span and self-diagnosed ADD. Anyway, I highly recommend this edit! I could have sworn I wrote a review for this years ago. Maybe it got lost in the switch to IFDb. Maybe I never posted it. It's entirely possible that it's sitting in a word document on my old computer. Maybe some day I'll find it and post it here. Maybe, but for now, you get this review! It's strange. 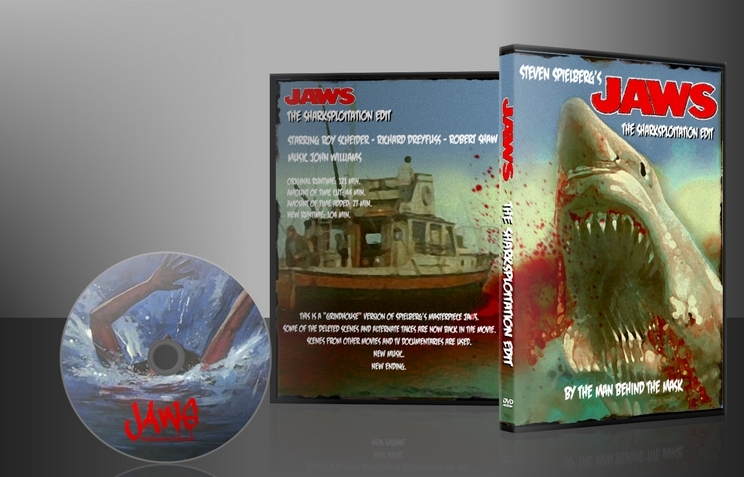 Jaws is one of my all time favorite movies. It's a truly great film that I love dearly. So it's strange, in a way, that I love this edit, even though its goal is to make the film much, much worse. Of course, that is the charm of it all, and I really appreciate what TMBTM has done here. 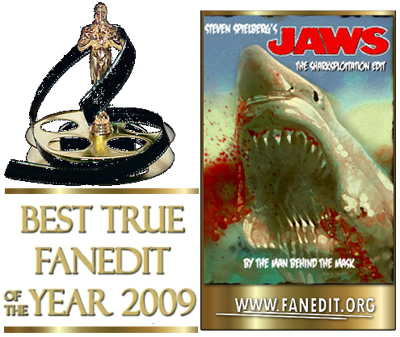 the music, the usage of other films, it all works wonders to accomplish the goal of the edit. If I have one complaint it is that the edit is too long. The pacing is not quite there. This really needed to be a nonstop great white thriller, but it's a little slower than that. All in all, though, great work here. Also, this features the greatest ending to any fan-made-anything ever.